Reader’s Annotation: Anna Grazinsky is meant to be a Russian countess but her country’s revolution leaves her family penniless and Anna takes a job as a maid in the household of a British lord in an attempt to rebuild her life. 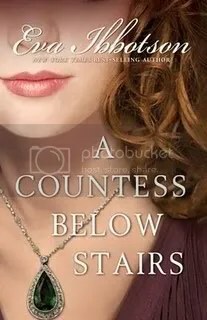 Summary: The Grazinskys are renowned among Russian aristocracy for their hospitality as well as their wealth, and their young daughter Anna is expected to take her place in society as a shining star. Then the tsar is assassinated and the now penniless family flees to England where Anna takes a job as a maid in the household of Rupert Frayne, the Earl of Westerholme. Rupert’s fiancé, Muriel Hardwicke, brings all manner of distress to the household with her philosophies regarding eugenics. Though Rupert finds himself drawn to Anna, he is bound by his word and financial destitution to the wealthy Muriel. In a strange post-revolutionary world where a maid may be a countess, the rich have no class, and the aristocracy has no money, the love of two virtual strangers strains to prevail against the odds. Notes: In this story, all of the characters, principal and minor, are richly drawn, engaging the reader from beginning to end. This book is a worthy read for fans of historical romance.